Magical Girl: Birth of a Star! Play Story Mode for the first time. Clear all of Ion's episodes. Clear all of Kirio's episodes. Clear all of Aoi's episodes. Clear all of Leafa's episodes. Clear all of Raiga's episodes. Clear all of Kyouichi's episodes. Clear all of IkS=Piari's episodes. Clear all of Lazona's episodes. Clear all of Mersa's episodes. Clear all of Claudio's episodes. Clear all of Avain's episodes. Clear all of Albis' episodes. 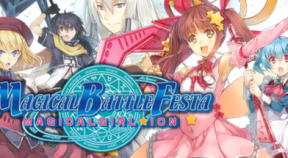 Play the Magical Battle Festa Mode for the first time. Earn an S Rank in the Magical Battle Festa Mode. Earn an S Rank in Survival mode. Unlock Mersa Gloria as a playable character. Unlock Claudio Vecela as a playable character. Unlock Avain Clane as a playable character. Unlock Albis the Specter as a playable character. Unlock Corrupt Ion as a playable character. Unlock Overdrive Claudio as a playable character. Set up your Character for the first time. Complete 50 battles using either Ion or Claudio. Complete 50 battles using either Aoi or Kirio. Complete 50 battles using either Leafa or Kyouichi. Complete 50 battles using either IkS=Piari or Lazona. Complete 50 battles using either Raiga or Albis. Complete 50 battles using Mersa. Complete 50 battles using Avain. Successfully stun 20 times using Kyouichi's sway counter. Successfully throw 50 times using Mersa, Avain, or Albis. Successfully use a sway counter 20 times. Successfully use a Just Guard 10 times. Use Force Reject to counter and damage your attacker. Successfully use Force Reject 5 times in a row. Successfully win 5 close contests. Win 5 battles with an Ultimate Force attack. Use Formation Change 100 times. Use Formation Change 10 times or more during one battle. Successfully pull off a Formation Break 5 times or more during one battle. Suffer 5 or more Formation Breaks during one battle. Use Chain Drive 100 times. Use Ultimate Drive over 100 times. Spend over 30 minutes in the Training Mode. Connect to a Lobby Server in Network Mode. Win your first battle in Network Mode. Win 20 battles in Network Mode. Winn 100 battles in Network Mode.